The Startup Briefing for anyone planning to start a digital business! The Startup Breakout Briefing is the one-day intensive insight session for anyone planning to break out and start a digital business! Solopreneurs, entrepreneurs and SMEs – turn your dreams into reality! The Startup Breakout Briefing is the jump-start event for people who want to turn their idea into a digital business. Tired of your job, or dreaming of independence? This briefing will help you start a business on the side, or go all out into your own digital startup. You’ll spend the day with a seasoned digital entrepreneur. You’ll gain a thorough overview of what it takes to start a side gig or a company. And you’ll gain amazing insights into how to organize, run, market, finance, monetize and growth hack your new business. You’ll never again get an opportunity quite like this! Full of up to date info. Amazing lessons/examples. Every question answered, every problem solved. Inspiring! Distilled from the three-day workshop, this day is intensive, and packed with information and guidelines. Your briefing leader is growth-focused, practical, and empowering. He will lay out and demystify the most effective path to startup success. He’ll explain step-by-step how to get from concept to launch. He will explain how to decide what legal form your business should take, and how to establish your own digital company, locally or offshore. He’ll show you how to avoid the common pitfalls of team selection and investor relationships, and explain the most effective routes to funding your business. He will share powerful ways of exploiting free or low-cost tools and platforms for growth hacking, marketing and sales. And he’ll provide you, step by step, the methodologies and ground rules for success in rapidly monetizing your business. You’ll leave equipped with a set of tools, hacks, strategies and tactics, inspiring examples, and guidelines for defining, creating and growth hacking your new business. This is an intensive one-day session designed to give you the big picture, as well as tons of detailed hints, tips, hacks and insights. 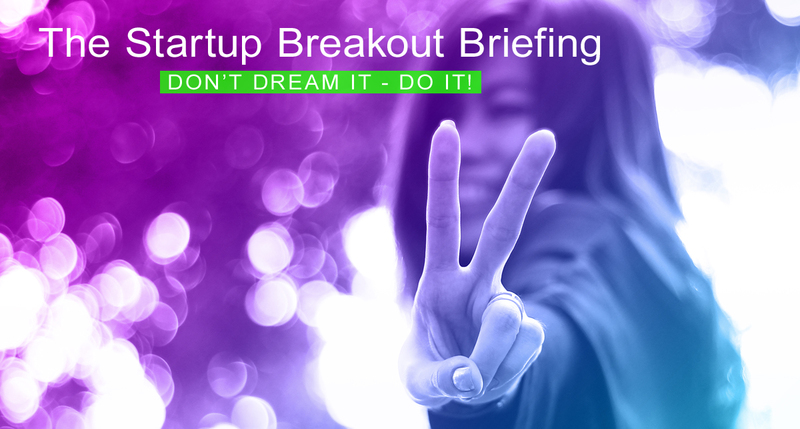 Ideal for people with only a basic knowledge of digital, the Startup Breakout Briefing will show you the way and jump-start your exploitation of all the available tools and techniques – without you having to be technical or have an MBA! In this increasingly uncertain world, the only real income security you have is in knowing how to make it on your own. You may dream of doing a WhatsApp and being acquired by Facebook for $19 billion, or of simply running a one-person lifestyle business, or perhaps a side hustle making some useful offshore income. You can follow your dream. You don’t have to be a programmer or have global ambitions. Digital businesses are not all about selling mobile apps. They are about using digital channels to find customers and grow sales – whether you are selling insurance, stuffed toys, haircuts, photography courses, graphic design, financial consulting, garden services, wedding cakes, or, yes, even apps. If your idea is truly disruptive, you may well be about to change an entire industry. Every startup begins with an idea. Most ideas never get going, because the person with the idea does not know where to begin. Many of those who begin don’t make it, because building and growing a digital business requires a different set of skills and processes. If you understand how to proceed, you will have the confidence to put thought into action. By the end of the briefing you’ll be inspired and motivated to succeed. And you will be well on your way to launching your own startup! The briefing is designed for non-technical people, who do not need to have any prior experience in business. It will get you grounded, inspired, and productive. Godfrey Parkin is a veteran digital entrepreneur with an international background in consumer behavior, marketing and business development. He’s founded global digital start-ups in Zurich, London, Washington DC and Cape Town, and has worked with clients in more than 40 countries. He ran the world-wide management services division of AC Nielsen. And he’s created pioneering businesses in computer games, 3D avatar and virtual world technologies, e-learning, digital marketing and sales growth hacking. As CEO of Britefire, Godfrey helps companies develop strategies to thrive in disruptive marketplaces. He’s currently a co-founder of a start-up teaching high-school math in India via a social gamified mobile app, and another providing personal safety management in Europe. Godfrey is author of the best-selling books “Doing Business Digitally” and “Digital Marketing: Strategies for Online Success”. He hosts the “Growth Hackers” TV talk show, broadcast throughout Africa, the Middle East and Asia. He leads the “Own the Future” business strategy workshop in mastering disruption. He’s on the faculty of USB-ED, and is a regular speaker at conferences on marketing, business strategy and future tech. Fee: Public workshop R1,950 per person. Fee includes VAT, lunch, refreshments. Johannesburg, Durban, or Cape Town. Book: Call Malinda on 021 794 7838. Brilliant! Obviously experienced and well-versed. I always leave Britefire workshops feeling inspired! Informative, interesting, humorous, and all-out amazing! Godfrey rocks! He is so clued up. Inspirational! Packed with practical tips. Got people really motivated! Godfrey has such a huge library of knowledge and its great how he shapes it. Godfrey is fun, interactive, has a great way of connecting! Eye opening - packed with practical examples. Cant wait to explore and engage more with our audience! Easily understandable, well thought out, comes from years of experience and understanding of the digital space. Fantastic! Absolutely great insight, teaches strategy and approach in an area misunderstood by marketers, media and business people, but also illuminating the huge potential.